It is easy to forget, amidst the flurry of post-Inauguration lipsyncing recriminations, that Beyoncé Knowles is a relatively new mom just throwing herself back into work. Her decision to prerecord the Star Spangled Banner serves as a useful reminder of just how flawless the Beyoncé facade normally is. 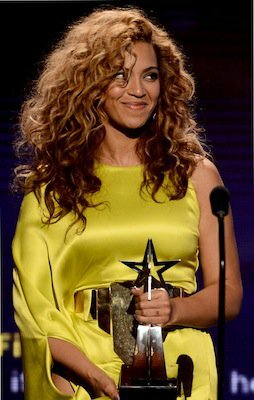 Shortly before her star political turn and just about a year after Blue Ivy, the world’s most famous baby, was born, Knowles wore a crop top football jersey, zippered red animal-print underwear, and a belly chain on the cover of GQ, accompanying an article that declared her the "hottest woman of the last 13 years." In February, HBO will air a documentary on her life, one that she directed and executive-produced. This week, she launched The BeyHive, a website and newsletter service that promises, like her pal Gwyneth Paltrow’s GOOP or her husband Jay-Z’s Life and Times, a branded blueprint for living life a bit more graciously. And this weekend she’s slated to perform at an event that is far more important to Americans than a presidential inauguration: halftime of the Super Bowl. Knowles is, of course, a smokeshow of rare distinction, a perfectly composed public presence, and an unusually gifted singer with a deep catalogue of chart toppers, but so are plenty of pop stars. She has become, in recent years, something more: an aspirational talisman for American women of all races. It is a small club, perhaps one whose only other members might be Oprah Winfrey and Michelle Obama. But where Winfrey is a single career gal (on the grandest scale) and Obama has temporarily put her own career aside for her husband and kids (also on the grandest scale), Knowles has both the gangbusters career and the perfect-seeming family life. She has transformed herself into an icon of Having It All. An abiding motif in Beyoncé’s work has been economic agency and what exactly it has to do with being a modern woman. Having It All, for anyone who hasn’t read Anne-Marie Slaughter's article in the Atlantic or read one of the many blog entries chewing over the concept or read Helen Gurley Brown’s book by the same name, is the ultimate prize in the modern femininity Olympics. It means sacrificing nothing—neither traditional notions of womanhood nor career fulfillment nor glamour—except, perhaps, any modicum of free time. Having It All is, in short, supposed to be impossible. (Unless, perhaps, you're illuminati—as a sizable contingent believes Beyoncé to be.) Beyoncé isn’t the first singer, by a long shot, whose career has gotten an extra kick of fire for happening to dovetail with the feminist preoccupations of the moment. Loretta Lynn sang about the Pill; Madonna pushed the boundaries of sexual iconography; Lady Gaga has crusaded for a more expansive understanding of sexual identity. Though it’s been dinged as an upperclass problem, Having It All is a slightly more perfectionist version of doing it all, a life challenge with which America’s swelling ranks of single mothers and female breadwinners—who cut across a far larger socioeconomic and political swath of the country—are also dealing. In the trailer for the upcoming HBO doc, a Knowles voiceover lays out the dilemma of going after such an existence. "I felt like I had been so commercially successful, but that wasn't enough. There’s something really stressful about having to keep up with that. You can't express yourself. You can’t grow. It is the battle of my life. So I set a goal. And my goal was independence." To that end, Knowles broke from her father-manager in recent years, and developed a more mature sound, one that critics agreed represented a move away from pop trends. But as the trailer’s next shot makes clear, her challenges aren’t just professional. There is footage of Blue Ivy’s sonogram, and of Knowles’ pregnant belly. She returns to career footage, the stakes properly elevated. "People see celebrities, and they have money and fame. But I’m a human being. I get scared and I get nervous just like everyone else. … Power’s not given to you. You have to take it." It is, as wide lettering announces, "A film by Beyoncé Knowles." The film, in addition to providing plenty of eye candy for Beyoncé and Jay-Z fans, takes as one of its themes a fairly explicit feminist one. "You know, equality is a myth, and for some reason, everyone accepts the fact that women don't make as much money as men do. I don't understand that. Why do we have to take a backseat?" she says. "I truly believe that women should be financially independent from their men. And let's face it, money gives men the power to run the show. It gives men the power to define value. ... It's ridiculous." It’s not a new tack for Knowles. An abiding motif in Beyoncé s work over the years, going all the way back to her Destiny's Child ingénue days, has been economic agency and what exactly it has to do with being a modern woman. "This goes out to all my girls that’s in the club rocking the latest/Who will buy it for themselves and get more money later," she sang in 2011's "Girls Who Run the World." "I done got so sick and filthy with Benjis," she brags in "Diva" ("the female version of a hustler.") "I buy my own diamonds and I buy my own rings" went "Independent Woman," seemingly rebuked by the "All the Single Ladies" wish for a dude-purchased rock. But really, like the rest of it, "If you liked it then you shoulda put a ring on it" is about knowing one’s inherent value in all marketplaces: It’s a third-waver’s justification of a visit to Tiffany, just as the question "Can you pay my bills?" in the classic scrub-takedown "Bills, Bills, Bills" wasn’t a plea for a man to take care of things, but rather a demand for a partnership of equals, which brings us to her marriage to Jay-Z, nicely explained in a 2006 duet with him. "Partner, let me upgrade you," she offers. "Taking care of home and still fly (that’s a good look)," she replies. "I can help build up your account. (That’s a good look, better yet a hood look.) But ladies, that’s a good look, believe me." After all, appearances are important to Beyoncé’s version of Having It All. As she revealed in the GQ interview, she employs a fulltime “visual director” who has catalogued her life for years. In the forthcoming documentary and on Knowles’ addictive photo-based Tumblr, snippets of her perfect-seeming life are doled out, just intimate enough to make us feel as if we're truly being allowed behind the curtain and just curated enough to remind us we're not. There she is on a beach with Jay, enjoying their apparently perfect marriage; here she is in a recording studio laying down another hit. As she told GQ, she feels more complete now. "Giving birth made me realize the power of being a woman," she said. "I have so much more substance in my life." But also: "I love my job, but it's more than that: I need it." The menagerie of stylists, managers, assistants, and nannies who make it all possible aren’t foregrounded. After all, this is part of having it all: pretending you didn’t have to break a sweat to do so. Perfectionism is her stock in trade, what’s brought her legions of fans even if it sometimes backfires. This regality disguised as realness is off-putting for some, but for the vast majority of those who consume Beyoncé s visual hagiography, wondering how she does it is more fun than feeling as if you know how. It might be one of the reasons her inaugural lip-syncing got such attention. The famously controlled singer reportedly made the decision at the very last minute, nervous about the vagaries of cold weather and wind, unwilling to screw up, even in a minor way, on such a public stage. But, as recent jeremiads about the Having It All culture have pointed out, that’s one of the risks of trying to be perfect at everything: Sometimes the pressure makes the experiences themselves less rich, even if they seem from the outside to be pitch-perfect. Of course, there are very few people with whom Beyoncé could credibly sit around and talk about the pressures of her life, and have the playing field’s challenges feel equal. (Though it’s easy to imagine this comprises a certain amount of her Gwyneth bonding, alongside trading tips for mink eyelashes and Madeline Weinrib rugs for the nursery.) Lately, though—and against all odds, given her previous armor of glamour—Knowles seems determined to point out that even for her, it’s not easy. She has begun to talk about that publicly. "I've sacrificed a lot of things, and I've worked harder than probably anyone I know, at least in the music industry. So I just have to remind myself that I deserve it," she said to Wallace, sounding like someone ready to be recognized for juggling so much stuff. But then there’s this: "Stop pretending that I have it all together," she says in a video diary cited in the same piece. "If I'm scared, be scared, allow it, release it, move on." For a moment, she sounds like someone admitting things aren’t quite perfect. But then, she continues. "I think I need to go listen to 'Make Love to Me' and make love to my husband." Even in that moment, she can’t help herself from reminding us, and herself, that her life is complete.